the_silver_panther has no other items for sale. 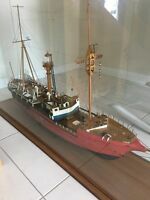 Vintage Lightship ELBE 1 MODEL, large handmade wood model, custom glass case. Payment via Paypal is preferred.